The month started out with these cute little treat baskets that one of our neighbors left on our doorstep for May Day. John and I tried to do this experiment where you drop a lit match into the bottom of a glass bottle and put a peeled hard-boiled egg on top. The egg is supposed to squeeze through the hole due to the heat coming up from below. Well, this is as far as the egg got, which is to say, nowhere. The matches would not stay lit on their drop into the bottle no matter what we did. Science experiment fail! Sam took a break from tape for a little while in order to experiment with glue. Sam made a tablecloth out of napkins totally randomly one day. He's so funny! 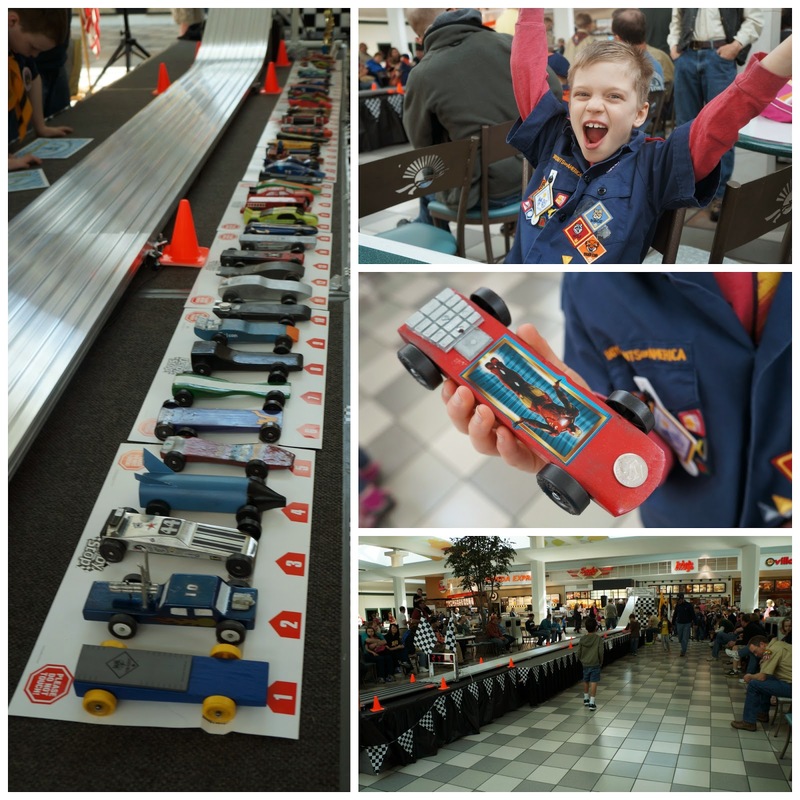 John's Regional Pinewood Derby race was held at the mall. These were the top cars from each of the Scout packs in the area. With that as the qualification, his car did pretty well--he didn't lose any of his heats-- but it wasn't an overall winner or anything. It was fun! We'll see if he ends up here again next year. After the race we went to Kids' Safety Day in the mall parking lot, where the boys got to go in fire trucks, an ambulance, a police car, and even on a police motorcycle. My Dad had to have his moment of glory on the motorcycle too. After that we headed over to nearby Mormon Handcart Park, which my Dad hadn't seen before. After three years of living in Iowa we finally discovered it last summer. It's a peaceful, historic, pretty little gem. It's neat to live in a place with pioneer history like this. Can you see John, running way ahead? "Today as you look around you, remnants of the forest and prairie remain much as they did at the time of the Mormon encampments." I love that. Sam painted on the window. "Sam, don't do that!" I said when I discovered him. Then I got my camera and took pictures as he continued to do it. I'm such an enabler sometimes. Really though, I decided it wasn't a big deal, and it cleaned off easily, and it's a cute, classic kid thing to do. Sometimes it's okay to relax, and that doesn't mean enabling, it just means you changed your mind, right? Sam got himself all packed and ready for a weekend trip we took to Nauvoo, Illinois. He was so pleased with himself. He looks like a little hiker. We spent a very pleasant Mother's Day weekend in Nauvoo. Now that is a wonderful place for church history! These were my Mother's Day gifts. Peter made delicious stuffed mushrooms, one of my favorite appetizers, to go with dinner. He makes really good stuffed mushrooms. After years of watching John do it, Sam made it to the top of the soccer ball at the mall's indoor play area. He was so happy! Swim lessons ended. That's John learning how to dive and Sam sitting on the edge a little further down. The boys are turning into fishes! They love the water. Wrestler Herky (wrestling is very popular here). The golden glow of a lovely May evening. Another thing that makes me happy is my organized and curated recipe and cookbook collection. I wrote about the completion of this project last month. I'm very happy with it! Speaking of projects, one of mine in May was my annual deep-cleaning and de-cluttering of the boys' bedrooms. It is unbelievable how much junk kids acquire! Their rooms are only ever this clean after my annual clean-out, so I document it with pictures every year. It's fun to compare with years past and see how their rooms change as they grow older. The pile of toys on the floor are his action figures. They were having a "battle," so I allowed them to stay where they were, even though I really just wanted to pick them up so that the floor would be completely clean. Sigh, the things we do for our kids. This bed is big. It has a secret passageway in the back of it. The stuffed Angry Birds collection. This cute decorative pitcher was at Hobby Lobby and I bought it on a whim because I liked it. Then when I brought it home I saw that it would be the perfect place to let my dying Mother's Day flowers live a much longer life as dried, decorative flowers. Speaking of being crafty (kind of), the teacher gifts we did this year were a cute idea for mint treat bags that I saw on Pinterest. They were easy and fun to put together, and the boys' teachers liked them. I got to visit my sister Elizabeth and her family for a little bit when I went back East over Memorial Day weekend. Their new puppy Clyde is so cute! I held him like a baby! I love babies and puppies. Not equally, but close! Rocco and Clyde (and my mom). I love taking pictures of the trees/sky/sunsets from my front porch (if you couldn't tell by the many times I've posted about it on my blog over the last few years!). I like how the sun is a perfect circle shining through the trees here. We ended the month by going on a family hike. It didn't go so well. It was very buggy out, and our insect repellent didn't work, so we were all attacked. Needless to say, the boys did not enjoy it. Right after that we went out and bought Bug Soother spray, which works really well. We should have done that first! Oh well. We'll take a hike again later this summer. The trail was really nice. The boys tried to out-run the bugs most of the way. It didn't work. I love how this picture turned out. The lighting must have been perfect the moment I snapped this shot. So the month started with a science experiment fail and ended with a hiking fail, but there was lots of good stuff in between! Best book I read: Hands Free Mama by Rachel Macy Stafford. Read my post about it here. Best TV: Meryl and Maks won Dancing With the Stars. I was so glad they won because they really were the best. She is an amazing dancer both on and off the ice! Best movies I saw: Frozen (finally!) and The Young Victoria (one of my favorites). I got a new calling at church--Nursery. I love it! Bad health stuff (not to sound like one of those people who are always talking pessimistically about their health issues): I had to get my eyes dilated. I got a painful canker sore. I got another cold. But by far the worst health thing that happened was a very painful shot I got in the sole of my foot for my plantar warts. If I had known how much it would hurt and how it would leave me unable to fully walk on my foot for the next two days, I never would have gotten it. The good news is that it worked and has been helpful in eradicating the warts, but I still don't think it was worth it. I think it was the most painful shot I've ever gotten in my life! Never again. My Dad was here visiting for about two weeks. I miss my family a lot so it's always nice when one of them is here to visit. Peter's parents also dropped by for a visit. Toms shoes. They're very comfortable, cute, and classic. I like that for each pair you buy they donate a pair to someone in need. I really like them. Saltwater sandals. I've been wanting to get a pair of these for awhile. They're cute and they're practical for getting wet, so they'll be perfect for summer and walks down to the beach at the Cape. These Chocoholic cupcakes from Scratch Cupcakery. Divine! Fun trips: We went to Nauvoo over Mother's Day weekend with my Dad. Over Memorial Day weekend I went to Massachusetts to work on the Cape house and get it ready for the summer renters and for us. I got to fly first-class, and it was very nice. It's a whole different flying experience up there! While I was gone, Peter and the boys spent a fun weekend in Des Moines. Random observations: Lake Michigan is HUGE. I've flown over it several times and I still can't get over how big it is. I shot a gun for the first time. Three of them actually. I fired a few rounds from each of them and even hit the target the majority of those times. The Midwest is rubbing off on this New England girl more and more the longer that I live here!